In his left hand, Padmasambhava holds a human skull cap, symbolizing the overcoming of death, with a vase containing the elixir of immortality Against his shoulder leans the magician's staff topped with a trident. 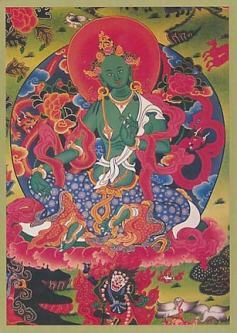 Historically Padmasambhava was the Indian prince responsible for the introduction of Buddhism into Tibet during the eighth century. 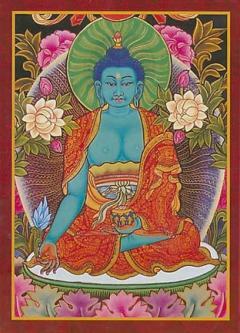 Padmasambhava Tibetan Buddhist Greeting Cards : These colorful greeting cards feature images from Tibetan Buddhism, in particular the major deities found in Mahayana Buddhism in Tibet and Nepal. 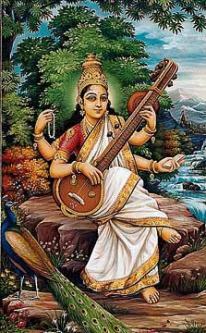 Each card explains the meaning of the deity depicted on the card, but the inside is blank so you can compose the perfect note to a loved one or friend. 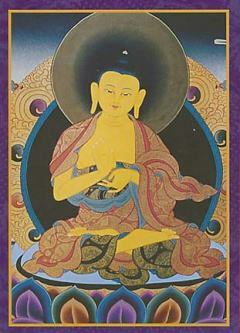 Padmasambhava is considered the founder of the Tantric (or mystic) schoo of Buddhism known as Vajrayana Buddhism. His name means "Lotus-Born," and he embodies supreme truth and can appear in countless forms. In his right hand he holds the Vajra, a representation of a lightning bolt or a diamond, which is the symbol of power.